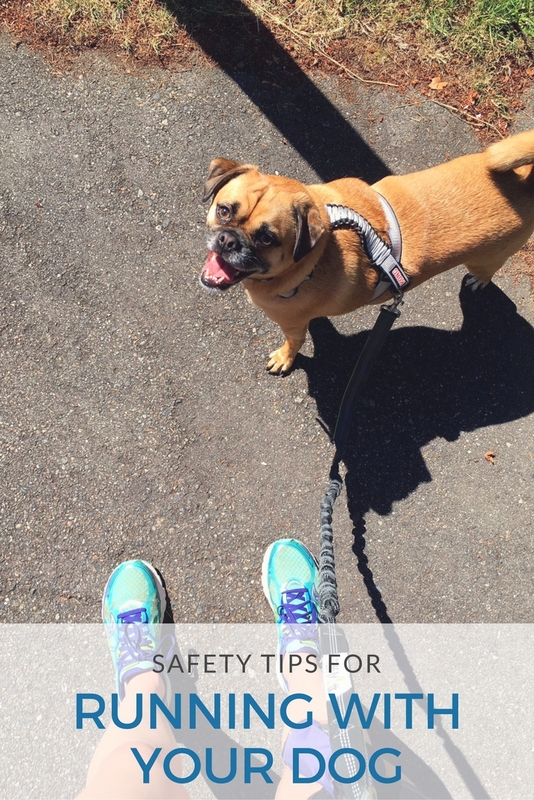 Just as personal safety should be the priority on a run, your pet’s safety should be the primary concern when you run with your pet. Ryan and I run both Charlie and Ollie several times a week. I ensure their safety and happiness on our 3-4 mile runs by the gear we use, where we run, and even what they eat after a run. Not only does this make running with your dog more comfortable, but a hands-free leash also keeps your pet securely attached to you at all times. 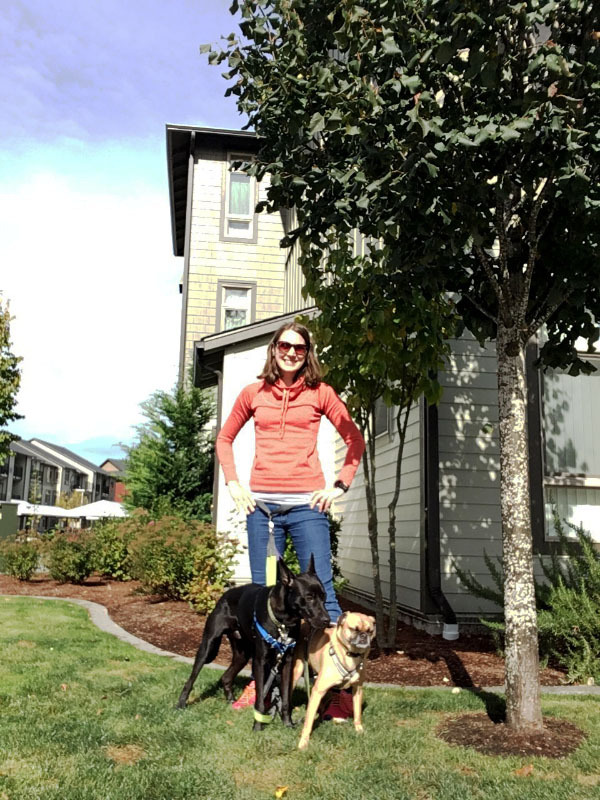 You do not need to worry about the leash slipping from your grip and your dog running into traffic or a cyclist’s path. Additionally, a hands-free leash avoids any muscle imbalances or changes in running form, since your dog will not be pulling on one side of your body. This will prevent injuries or a strained shoulder when your dog decides to chase a rabbit across the path. When I run with Charlie and/or Ollie, we run on paved trails to avoid encountering any vehicles during our run. Especially since both are medium-sized dogs, I’m extra cautious when it comes to him and road traffic. Even a sidewalk can put us in close proximity with cars driving by at 30 mph or faster. 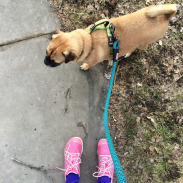 Both Charlie and Ollie also love running on paved trails because they can see rabbits, ducks, and other animals, so in addition to their safety, both dogs will enjoy the run more. Charlie’s harness is reflective, which means he will be visible to walkers, runners, cyclists, and drivers on our runs. The hands-free leashes are also reflective and I ensure that I wear reflective gear or bright colors as well. On the rare occasion that we run before sunrise, I’ve strapped one of my flashing running lights (this Amphipod light) to his harness to ensure visibility. 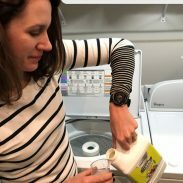 We care about our own nutrition after a run and should do the same of our pets. I’m not eating nutritionally poor, artificial ingredient-filled food after my run – and I don’t want Charlie or Ollie to either. Food safety for dogs is different than food safety for humans because dogs are sensitive to or cannot digest certain foods that we humans can. Basic food safety that we follow also applies to our dogs as well. Even when you avoid feeding these foods to your dog, ensuring food safety can still be difficult. Some companies are lenient about the ingredients they put in their dog food. Even high-quality ingredients run the risk of being contaminated and causing food poisoning. Thankfully, pet food companies such as Natural Balance® make pet food safety easy for pet owners. With Natural Balance, I can ensure that Charlie is eating safe and nutritious pet food. There are no toxic preservatives or fillers that could compromise his health, digestion, or fitness. Natural Balance performs nine safety tests on their food to ensure its safety. These toxic ingredients include aflatoxin, cyanuric acid, vomitoxin, ochratoxin, salmonella SPP, and zearalenone. Natural Balance’s Buy with Confidence ® promise ensures that our bag of dog food or treats has been tested for safety. When selecting dog food for Charlie, Ryan and I look for a brand with a commitment to safe, high-quality, nutritious pet food. Natural Balance Dog Food offers exactly that – with a variety of flavors that your pet will love. Just as Ryan and I eat a high-quality diet and avoid processed foods in my own diet, we do the same for Charlie’s diet. We selected the Limited Ingredient Diet dry food for Charlie, which contains no artificial flavors, colors or chemical preservatives. Natural Balance Limited Ingredient Diet food provides the nutrition Charlie needs to support his active lifestyle. With proper nutrition, Charlie can safely enjoy his weekly runs and long weekend hikes. When we gave him Natural Balance Limited Ingredient Dry Food, Charlie gobbled up his bowl. He loved the Lamb Meal and Brown Rice flavor! He then sniffed the bag to indicate that he wanted more. Charlie enjoyed this food at each meal time! We also purchased some Natural Balance Limited Ingredient Treats for Charlie and Ollie. Charlie actually doesn’t like most dog treats, especially those with artificial flavors. However, Charlie savored his Natural Balance dog treats and begged for another one! Natural Balance dog treats contain real food like potatoes and meat, with no corn, soy, or artificial ingredients. 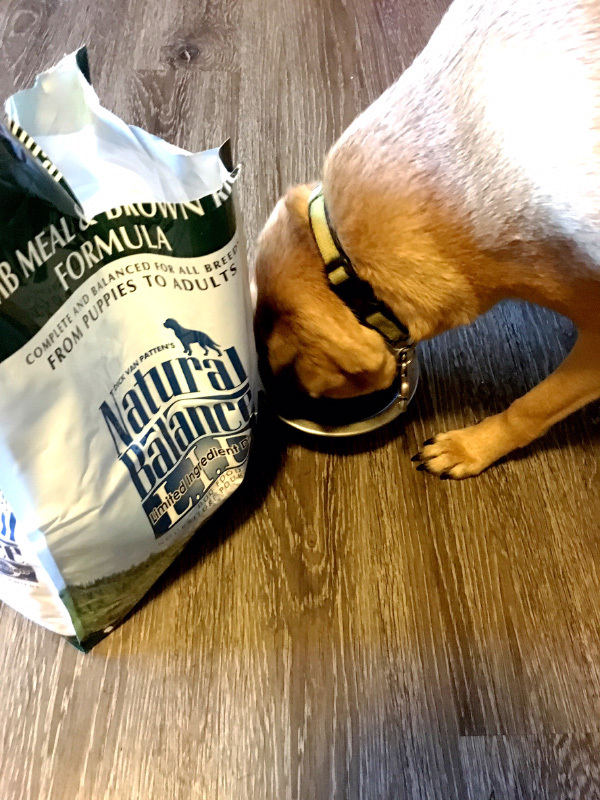 When we began to train Ollie, we used Natural Balance dog treats because he liked the flavor and the treats were safe enough to feed him without causing any stomach upset that can occur in a newly rescued dog. I feel assured about Charlie and Ollie’s health and safety when giving them a Natural Balance dog treat after a hard run or hike. You should slowly introduce a new dog food into your pet’s diet. We gave Charlie a 50/50 ratio of his current food and Natural Balance food for several days. This reduces the risk that your dog will not experience any negative reactions to the new food. When we adopted Ollie, we gradually introduced Natural Balance Pet Foods into his diet. 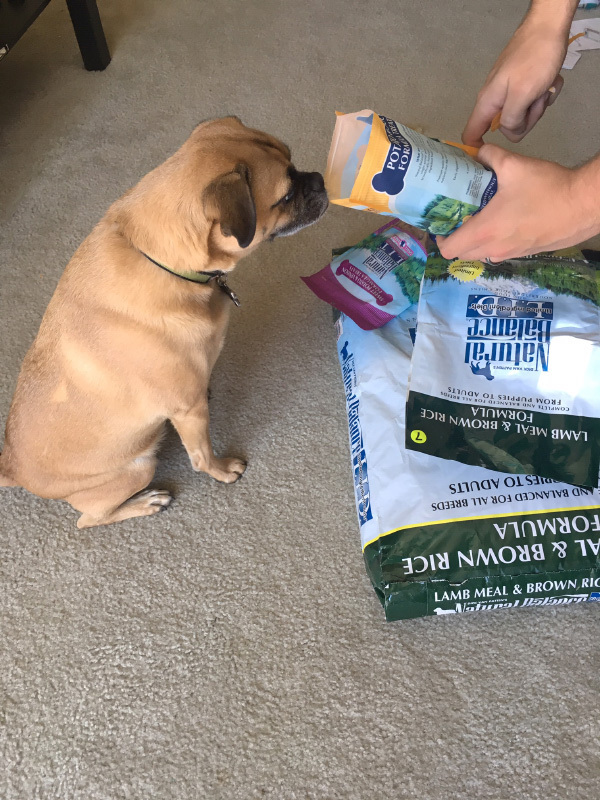 Ollie needed nutritious food to help him gain weight and Ryan and I both trusted Natural Balance Pet Foods in order to get him to a healthy weight while still promoting overall health. When you run with your pet, their safety is important – both during the run itself and in the food they eat afterward! With Natural Balance dog food and treats, I don’t have to worry about the safety of Charlie and Ollie’s food. I know with Natural Balance’s Buy with Confidence® guarantee that only good, nourishing food is in their bowl after each run. I encourage you to try Natural Balance for your dog or cat. I’ve honestly been very pleased with how much Charlie enjoys this food. Natural Balance Dog Food is available at pet retailers across the country including PetCo, Petsmart, Mud Bay, and more. Natural Balance stands out in an industry full of food recalls and issues. Normally, paying more for a product means that it is higher quality but that isn’t a guarantee in today’s world. That is why Natural Balance goes the extra mile to test all of our products for safety. They care about your pet’s health and happiness above anything else! I’m giving away a $100 Visa gift card to one lucky reader! Answer the question below in the blog comments to enter to win. What’s your favorite breed of dog? This sweepstakes runs from 11/9/2016 – 2/09/2017. 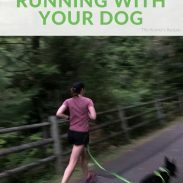 Do you run with your pet? I wish I could take my dog running! He has bad joints and whilst he would absolutely love to go running, his joints just couldn’t handle it! I wish Cooper loved to run with me on the roads. He’d much rather go at his own pace rather than me setting it. But he loves to run on trails. It’s his (and mine too) happy place. My favorite breed is labs. But really, I love all dogs! God knows my cat could use a little exercise! 😉 She’s FAT. I love my shih tzu, but so many breeds are great! I will have to look into a hands-free leash. It sounds like it is a much safer option. Thanks! We hope to get a pup soon so these are helpful tips. And thanks for the info on dog food! I love my Rat Terrier named “lane’. My favorite breed of dog is a Maltese. My favorite breed is a border collie. I have two and they definitely keep me moving. In fact they’re the reason I got into running. My 12 year old can still go on 13 mile training runs (vet approved). My favorite dog breed is goldendoodle! St. Bernards are my favorite breed. My favorite breed of dog is the basset hound. They have those big eyes and long ears that just melts my heart! The big eyes are also so melting! I can’t handle them. My favorite breed of dog is Maltese. I like border collies best. Our mutt is my favorite breed 😉 But I also love Springer Spaniels because I grew up with them. My fave breed since I was a child has been a Sharpei! Love those wrinkles. I like Golden Retrievers the best, but that’s probably because I have more experience with them! My favorite breed of dog is the German Shepherd. Black Labs are my favorite. Thanks so much. I’m partial to Jack Russell terriers but would probably get a Golden Retriever since they’re such good family dogs. I have a Cavalier King Charles Spaniel named Daisy. Her breed is my favorite. They are so lovable. I like the German Shepherd. That is hard for me to choose! I think yorkies are great. I like their personalities the most aside from lab retrievers. Thank you for the chance to win! I like labs. So cute and fun. I like terriers a lot. My favorite breed is the Papillon. oops….that’s not the tweet link! I love Dachshunds so much! I think dachshunds are really cute. We had one when my son was little and his name was Fritz. He was a great dog. I love all dogs, but have a fondness for shar-peis. We have 2. I have a Black Lab/Pitbull so they are my favorite breeds. Put them both in one and it is even better. My Tuc is a big goofball who loves the snow. I’m a fan of the Airedale Terrier, they look great and have a mild temperament. Also, they don’t shed much…Super bonus! I love Australian Sheppard. They are beautiful They are alot of work but if they are well trained, you have a loyal dog. My favorite dogs are the mixed breeds from the shelter who need good homes. I have to say german shepherd. Ooo that is a hard question to answer. I am actually a cat owner but I do love dogs. Never had one as a pet but love them. hmmm It would probably be a Pug/Pug-like dog. I love their size and smooshy faces. Oh my gosh I love them all but if I had to pick I would say Golden Retriever! We have a chocolate lab, so that is my favorite breed of dog! My favorite breed is German Shepherd but I enjoy dogs of all kinds. My favorite breed is a West Highland White Terrier (terror! lol) They are so sweet, but obstinate and hard headed, besides being very nosy. They do need attention and love, which we give ours all the time. Wouldn’t trade her in for the world! Hard to choose just one breed – especially since I have a mutt! Can I vote mutt? Haha.. he’s part Golden Retriever so I’d probably say that. My favorite breed of dog is definitely golden retriever! They are so sweet and beautiful! My favorite dog breed is Border Collie. My favorite breed of dog in the English Springer Spaniel.